Me: What are the best sturdy homemade treats for mailing? And of course the Original Nestle Toll House Chocolate Chip Cookies. When my grandfather was alive, I would send him several batches of cookies throughout the year. They ship very well! Here are some tips for shipping cookies: So that your cookies arrive in one piece, it’s best to wrap four of the same size cookies together in plastic wrap or aluminum foil, then place in a resealable plastic food storage bag and seal shut. If you are shipping two kinds of cookies, you should double-wrap the cookies so that the flavors don’t blend together. Line the container you plan to use (decorative tin, etc.) with bubble wrap. Place the heaviest cookies at the bottom of the container and layer the wrapped cookies with bubble wrap or crumpled paper towels. Attach lid, then wrap one more in bubble wrap. Put the container into a sturdy cardboard box (be sure to add bubble wrap to the inside bottom of box). Use bubble wrap or crumbled newspaper to protect the container inside the box. Me: What is an easy treat for kids to make and give away to their teachers and coaches? 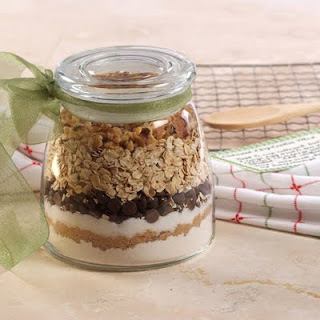 Chris: Here are a several ideas: Kids love to assemble cookie or brownie ingredients in a jar. All the recipients need to do is add butter, vanilla and eggs. I just love these dipped pretzels. You can add sprinkles, chopped nuts, etc. For teachers, these would be adorable placed in a mug, then wrapped in cellophane. Decorative bags work well too. Last year, my son painted a coffee mug for his teacher, then added homemade cookies inside. She cried. I actually have it on camera, it was a very sweet moment!Party Mixes work well too. Just place in a decorative bag and you are done! Me: Is there a great treat that could WOW at a holiday party that an inexperienced baker could pull off? 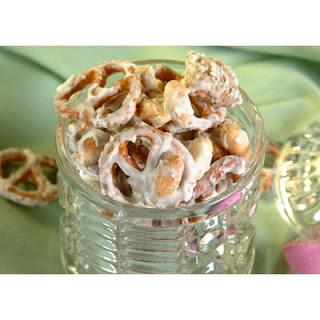 Here is another one I love, these glazed nuts are great served in a bowl, on a cheese plate or in salads. Not necessarily a “treat” as in dessert, but a great addition to a party. Me: What are some inexpensive, pretty treats that you could give as gifts to neighbors and coworkers? Bark is also perfect to give as gifts! You can present in a decorative tin or cellophane bags. Thanks, Chris! I've got the double chocolate dream cookies in the oven and I'm making the Magic Mint Chocolate Bark (just two ingredients!) for a party this weekend. Thanks for the great ideas - i'll have to try some of the yummy treats. This post has my mouth watering. I haven't decided yet as to what to do for Christmas baking, but you've shared some great recipes. Mmmmm! I love Holiday baking! I love house the house smells, and it makes my all happy inside to see stacks of freshly baked cookies, or loaves of pumpkin and banana bread cooling on racks. My very most favorite Christmas goodie would have to be Chocolate Dipped Pretzels. Sweet and salty....perfection! I think the mixes are just a fantastic idea for kids! I love any kind of fudge. Christmas is the best time of the year for SO many reasons! Great ideas. I wonder if I can pull something together this afternoon for my son's preschool teachers, sine tomorrow is the last day. Thanks for sharing. I love the picture of the holiday gingersnaps. I never would have thought to roll them in festive colored sugars! One of my favorite holiday treats is rocky road fudge. Definitely only a once year treat but it is delicious! Down here in Texas, there's an ice cream company named Blue Bell. They make a special Peppermint ice cream that is divine. People stockpile the stuff, I am not kidding. It's creamy with bits of delicate candy canes. Delicate is the word. They aren't frozen and hurt your teeth, I swear they crunch and then melt. Ohhhh man. I'm off to the store. Must stockpile! I also like your spicy soft gingersnaps. I have made these a lot and everyone loves them. And oh my gosh, those dipped caramels could possibly change my life. I'm adding them to my list. I like to make your fudge, but my favorite treat is simple rice crispy treats with sprinkles on top. :) I'm rather plain. 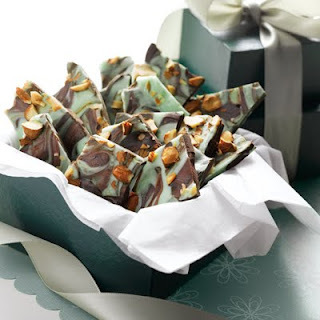 Oh,this chocolate and mint bark has my mouth water watering. I love bark!! I'm so happy to find your website! Favorite Christmas treat? Definitely my grandma's nut balls. Nougat covered in chocolate rolled in nuts. The BEST. My favorite holiday treat to see are peanut butter kiss cookies because I associate them with my favorite aunt and Christmas; my favorite to make are candy cane cookies, which I've made since I was very young; my favorite to eat is a wafer cookie, which melts in your mouth and looks so pretty. I think I better get baking! Christmas is a time when I think about Christmas markets and Lebkuchen. Although the snacks sound great and I want to try them, I still long for the gingerbread. fabulous ideas here. that last one, the bark looks so good! It wouldn't be Christmas without some gingersnap cookies. Yum! What cute Christmas gift ideas! I for sure want to give the Oatmeal Cookies in a Jar this year. Thank you! My favorite holiday treat is the Fudge I make from Nestle Semi Sweet Morsels. I don't do as much baking as I use to do. But I definately am gonna try that mint chocolate bark. Wow did that look good!!!! I love Swedish Teacakes with ground pecans, and thumbprints, they both remind me of baking with my mom. I love the ideas of cookie in a jar gifts. I wonder if I can still find nice jars in the stores. Thanks for all these ideas! Too many wonderful choices of treats to make during the holidays! I really wanna try those chocolate dipped caramels with sea salt--I'm in love with the sweet salty and think they'd be divine. My favorite holiday treats is what my family has always called Raisin Tarts, but I've learned over the years that they are actually Canadian Butter Tarts. Either way delicious, and a holiday staple around here. Also chcolate shortbread sandwich cookies (homemade Pepperidge Farm Milanos) and caramel corn. Must get baking! I love all kinds of sweets! Wow..so much sweets. I'm insanely jealous. How do you meet these people? How did she get her job? I want one like that! These treats look amazing! I was looking for new treat ideas for my neighbors...thank you. You just saved my Christmas baking! I was lamenting I didn't have time this year, but who doesn't have time for the bark! TWO ingredients and FIVE MINUTES???? What's not to love??? Great ideas! I love to make Chex Party Mix. Ginger snaps drizzled with white chocolate look beautiful and are delicious. 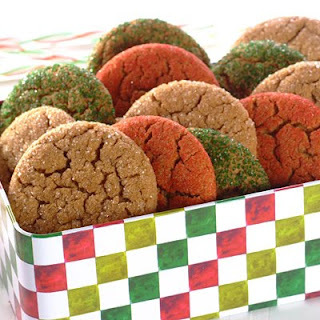 My husband loves gingersnaps and I never thought of rolling them in colored sprinkles. Thanks for the tip! I love having glazed nuts around too, and they're somewhat healthy, right? :) Such a fun post and giveaway! Thanks for the good ideas! I love all holiday sweets, so hard to choose just one. But I love the hand-dipped rum victoria chocolates I make only at Christmas. So many treats, so little time! My favorite Christmas treat is a simple yet delicious Bouche de Noel. Especially for Christmas breakfast. :) Thanks for all your yummy recipes! Love the ideas. They will be a perfect for family that is hard to buy for. Holy cow! How to choose? I think I'll have to make them all! Thanks for sharing! These look so good. I can't wait to try the chocolate mint bark. One of my favorite cookies to make at Christmas are the chocolate cookie with caramel inside. I go overboard with the white chocolate and walnuts on top and they are delicious. and it's really interesting. You'll have to tell Sailor that she and I qualify as "super tasters," which is really a rather complimentary way of saying particular! Loved the post, pictures and recipes. I'm anxious to try them. I loved my Mom's Divinty. She's not with me anymore, and I sure miss it. I can't make it to save my soul. Oh my gosh! How did I almost miss this post? I only have a few more hours...where have I been? Oh well, I am here now. 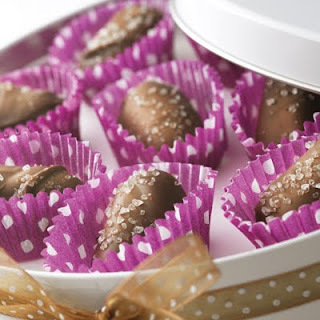 I think those dipped caramels look so simple, yet so yummy! I have so many favorite holiday treats, but year round, my favorite treat is always a cookie. Usually chocolate chip, but sugar cookies are also at their best at Christmas time. What are you doing for neighbor gifts this year? Have you decided? Because my dear hubby just made these delectable treats a couple days ago and even though I gorged myself on them, I'm still wanting more....Candy Cane cookies. The red/white ones. Mmmmm....and after reading this post, I'm thinking a quick light dip into a chocolate bath would make them some kind of wonderful! Pick me! Pick me! I'll have to try out a few of those recipes pronto!